I’ve had a lot of questions on how to tell which part of the scoli curve is concave versus convex. It’s time to have a lesson on deciphering scoli curves. Every scoliosis curve has a concave and a convex part. They are opposing sides of the curve. Most scoli spines have multiple curves and therefore have multiple concave and convex parts of the spine. I have a silly way to remember which side is the concave part of the curve by thinking of an actual cave made out of rock. If I’m inside a cave it’s round over my head. If I’m “in” the cave portion of a scoli curve it’s rounded over my head. Therefore, I’m “in” the concave portion of the curve. If I remember which side is the “cave” (concave) part of a curve, the opposite side of the curve is the convex portion. To give you a visual way to remember the convex part of a curve think of the rounded mirrors used in stores to prevent shoplifting. It’s rounded out, or curved out so the store manager can see lots of people in the store from standing in one spot. The convex part of the scoli curves rounds out. I’m going to use the picture sent to me by a young woman in Asia I used in the blog post here to describe this further. The numbers 2 and 3 are the concave portions of the curves and numbers 1 and 4 are the convex portions of the curves. Can you see how 2 and 3 are “inside the cave” of the curve? Can you visualize how 1 and 4 are going out? Most people’s muscles are beefier and more built up on the convex portions of their curve (1 and 4 in the picture above). While they are the longer muscles, they’re usually the workhorse muscles and have been attempting to hold the back upright for many years. The muscles inside the concave portion are shorter and usually more atrophied, which would be 2 and 3 in the picture above. Let’s take the norm of muscle development for scoliosis and turn it on its head. I wrote about Usain Bolt here, who happens to be of my favorite people living with scoliosis. For the third Olympics in a row he’s won the 100-meter dash and continues to reign supreme as the fastest man in the world. Yes, he has scoliosis if you didn’t know. And no, he has never worn a brace or had surgery. His back fascinates me, scoli anatomy nerd extraordinaire that I am, because he has trained the muscles in both of his concave portions to be BIGGER than the convex portions. That’s crazy from an anatomical standpoint! I don’t want to get any emails from people saying that’s just how he was built. No way. No scoli backs are built like that. I’m sure that’s how his trainers have halted the progression of his curves and helped his back, pelvis, and legs to function at the elite level that they’ve function at over the last 3 Olympics. He has more muscle in the concave portions of his curves because he worked those areas of his back to help stabilize his scoli curves. There you have a break down of the convex and concave portions of curves, the natural muscle development, and then what the fastest person in the world has done with his scoliosis to throw the normal concave/convex muscle development on its head. How do I build up the muscles in my back to halt to progression of my curve? I’m pleased to announce that Spiral Spine will be launching a new video series called Scoliosis Education. • You’ll learn how to untwist scoliosis using movement. • I’ll teach you how to analyze scoli so you can see what I see and do it on your own. 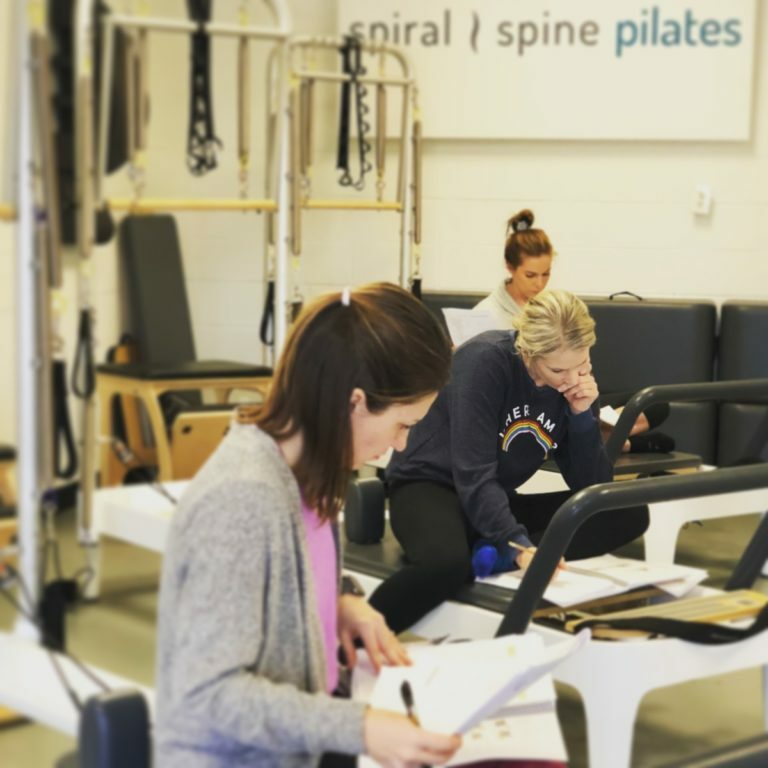 • You’ll also learn how to put an exercise session together for a child or teenager with scoliosis, that engages their mind and motivates them to workout and do corrective exercises. I’ll be releasing multiple 30-45 minutes videos over the course of this year. Each video will be FREE for streaming for the first 24 hours after it’s released. To register for the first webinar click here. 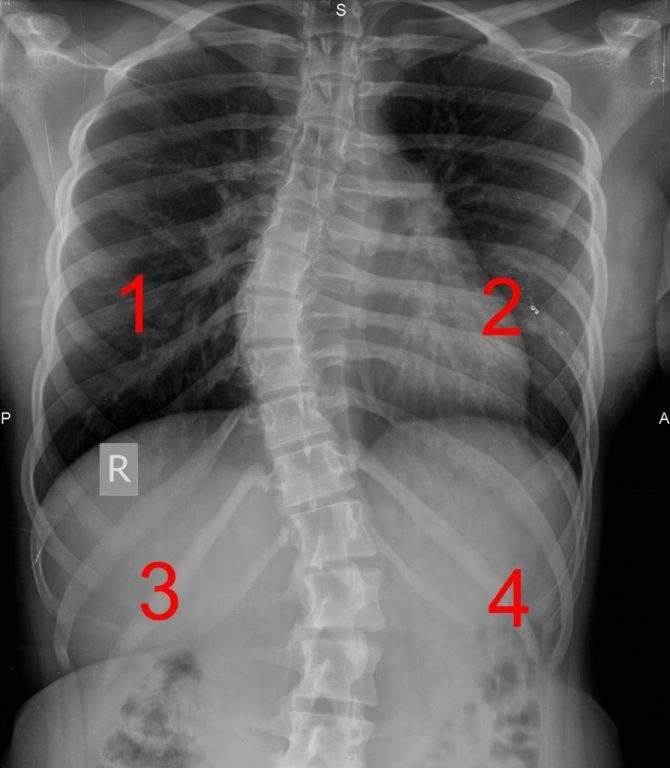 The x-ray image of the woman from Asia – does she have left thoracic scoliosis? Nope, she has an upper right, lower left curve. Notice the “R” on the left side of the X-ray. That means it’s the right side of the X-ray, meaning you need to flip the X-ray around in your head. Hi, my daughter has been doing well with strengthening her concave side but today she has overdone it and the muscles on her left side (convex) are hard and painful. Should she stretch these muscles over the gym ball ie. lie on a gym ball on her right (concave) side to help stop the spasm? First off, congrats on knowing what side of your daughter’s back to work. And please congratulate your daughter for owning her scoli! That’s huge. The fact that she brought her concave side, her sleepy side, into spasm most likely means she’s been working those muscles well for a while. Secondly, yes, she needs to release them because they are in spasm. Stretch them, release them with a small ball, book a massage with a great therapist to get their fingers into those muscles and make them pliable. Do any and all of the above. No need to freak out, your daughter has just successfully totally woken them up and they are freaking out a little bit. Release the muscles and they’ll be totally fine. Follow your intuition, because it’s correct. Nice job mom. The left side of my spine is always in pain, but my right side is rarely, if ever, in pain. Does that mean – in general – that I need to strengthen my left side? Oddly, it usually means you need to strengthen the right side. My guess is the left side of your spine where you are referring to us the convex part of your curve. The reason those muscles are in pain is because they are the work horses and are currently overworked. Those need to chill out and the the sleepy right side needs to start doing some work. Feel the right side of your back. Is it smaller than the left side? My guess is yes. On the shop page of spiralspine.com you can see Analyzing Scoliosis, my latest book, and a training video with the same title. Both will teach you about your back and which side you should work and why. Hi can I just specifically train my weaker side (concave )in the gym? I have scoliosis and my left side is much stronger and bigger than right. I was thinking just only traing my right side. Forexample : pull down with rigth arm only. Yes, you can. Now, be mindful that you are training the specific muscle(s) that is/are weaker. A pull down would incorporate the lat, and that goes all the way down to the bottom of the back. You need to make sure that you want the whole right side worked. Or you need to find a different exercise to work the specific muscle(s) you need worked on the right side. In my latest book, Analyzing Scoliosis, I have a whole section on figuring out exactly what muscles need to be worked–and I’d suggest you read that part. Way to go on wanting to use the equipment available to you at the gym to love on your scoli! So you have to build up the concave side? And stretch out the convex side? I always thought it was the other way. How exactly do you work on shortening the convex, once you build up the concave side? I talk about this in my latest book, Analyzing Scoliosis (available on amazon). Once both sides are bi-laterally even, or even the concave side is more built up than the convex, then you just do even, bi-lateral work because both side is finally working correctly. You can do anything where you work both right and left side of the body evenly. I hope this helps. 1. which side of the body should i trained more? The concave or convex side? 2. What exercises will be suit for me? I need some help! I had an x-ray a while ago and I don’t have the image itself anymore but I do have the written details… “Mild lumbar scoliosis concave to the right” (with “curvature of lower thoracic spine to the left”). Does “concave to the right” mean I have dextroscoliosis (curve to the right) or levoscoliosis (curve to the left)? So confused! It means your scoli spine is going to the left in your lumbar spine, so the right side is the concave side and your left side is your convex side. I’d suggest you do dot sticker pictures, a diagram sketch, and learn how to use a scoliometer since you don’t have your X-ray anymore. You can learn to do those on any of my videos or on the free starting point series at the top of the home page. But concave or convex are only names to refer to the outside and inner sides of the curve, waht is important here is to say that every scoliotic people MUST to know that the inner side MUST to be relaxed and the outside strenghtened. The oppossite would be something like a suicide. Most people’s convex erectors (et. al.) are in constant spasm because they are the workhorses and are on too much. Palpate the muscles on the concave part of someone’s spine and it’ll be nothing. No muscles are firing. To find balance, stretch then strengthen the concave muscles in a LENGTHENED state. Only then will the convex muscles be able to not be in constant spasms. If you strengthen the convex muscles immediately they will be in constant spasms. Don’t believe me? Try it. Eventually both sides will be strong enough to support you and THEN you can shorten the convex muscles to help to continue the process of stacking up the spine. It doesn’t matter what degree a curve is at. The inside is always the concave part and the outside is always the convex part. It will not make you worse. I’ve helped so many people straighten their spines both in my studio and around the world. I just got done teaching a Pilates class where a woman was in a lot of pain because she had been strengthening the convex part of her curve in an attempt to straighten it, and she was in so much pain. She needed to release that, and build up the convex part in an elongated state. Once those are strong enough, she can start to work the other side again. If you strengthen the convex side immediately, like this Pilates client, you’ll end up in spasms. The basic definition I said above is correct. It’s not my “opinion” or surgeons “opinions”, it’s a factual definition. If you don’t believe me, look up the basic scientific/mathematical definition online. Fantastic breakdown! I was engaged the whole way through your article. Plus, I didn’t know that Bolt has scoliosis! Thank you for sharing your expertise. I would like to register for the scoli education webinar mentioned above but when I click on “register here” I’m take to the page about renting the Maya video. How can I register for your upcoming webinar? I have left thoracic scoliosis, and right lumbar scoliosis. Some parts of my back are stretched, some are scrunched. Which areas do I need to strengthen, and which should I stretch?